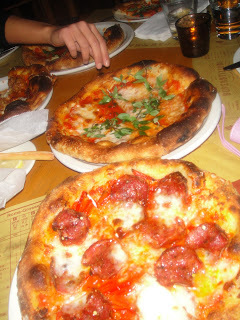 I went to Pizzeria Mozza last night with my girls on the corner of Highland and Melrose Ave. This place is famous in LA. It is a Pizzeria and Osteria attached next to each other, Pizzeria Mozza being more casual and Osteria Mozza being way more upscale and fancy. They both have different menus as well but they are the same restaurant.Mozza is known for their pizza, but is also known for having really good food all around. This place was so hyped up for me- everyone was always telling me how good it was. My family and I have tried to make reservations at this place for months but they never had anything available during regular dinner hours so it never worked out.You can’t get a reservation at this place unless you call a month in advance. Literally. They don’t even answer phones there. There are two numbers and they only answer one of them (which is the number not advertised on their website so no one even knows about that number). The only reason why I know this is because I know someone who works there. It is impossible to get a last minute reservation, they won’t even answer the phones. You have to make reservations online on Open Table. You might have luck to just walk in, but definitely don’t try during prime time dinner hour. Last night was a Monday night at 9pm, and it was JAMMED PACKED. Ok, about the food. Considering the fact that this place was so hyped up and requires you to make a reservation A MONTH in advance, I expected the food to be mind blowing. I have to admit, I was a little disappointed. I do have a high expectations when it comes to food, and don’t get me wrong the food was GOOD, but definitely not great. To top it off, we had a super rude waiter who seemed like he was having a bad day lol. He had attitude and we were definitely not having it. But anyway, they are not accomodating with substitutions, and they don’t have ranch to dip your pizza in. Fail. For appetizers we ordered the Butternut Squash Bruschetta with applewood smoked bacon and sauteed bitter greens. The brushetta was interesting. The sweet butternut squash would have been better if it was warm though. We also ordered their famous meatballs with garlic bread. It was good! We all ordered our own pizza for dinner. The crust was amazing. Love the thin crust pizzas with fluffy/crispy crust. It came right out of a brick stone oven. But other than the crust/bread of the pizza, it was nothing special. Good, but not mind blowing. It needed ranch dressing to be honest lol. Who else dips their pizza in ranch? I can’t eat pizza any other way…Classy huh? lol. Anyways, I will go back to Mozza eventually. I am going to order a couple different things I want to try. You always know how to order the second time around. Wasn’t too crazy about “their version” of my pepperoni pizza I ordered: Finnochiona salame, mozzarella, tomato & Fresno chiles. The pepperoni was spiced and had too much pepper for me.